With a 30-year fixed rate mortgage, mortgage rates tend to be higher as compared to a 15-year fixed rate loan, but payments are much lower -- sometimes by as much as 50%. Lower payments come at a cost, however, as mortgage interest costs add up over 30 years. Regardless, 30-year fixed rate mortgages remain the most common mortgage product for their simplicity and low relative payment. Which One Is Right For You? 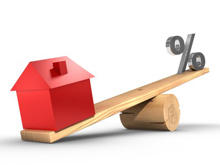 There is no "best" choice between the 15-year fixed rate mortgage and the 30-year fixed rate mortgage. Choose a product based on your short- and long-term financial goals, and your personal feelings regarding debt. Mortgage applicants choosing the 30-year fixed rate mortgage can qualify to purchase homes at higher price points, but those using the 15-year fixed rate product will stop making payments a decade-and-a-half sooner. There are benefits with both product types so, if you're unsure of which path works best for you, speak with your loan officer for guidance and advice.